Fully loaded Korean Beef Tacos with Bulgogi steak – because I know how much you all love Asian food (as evidenced here). 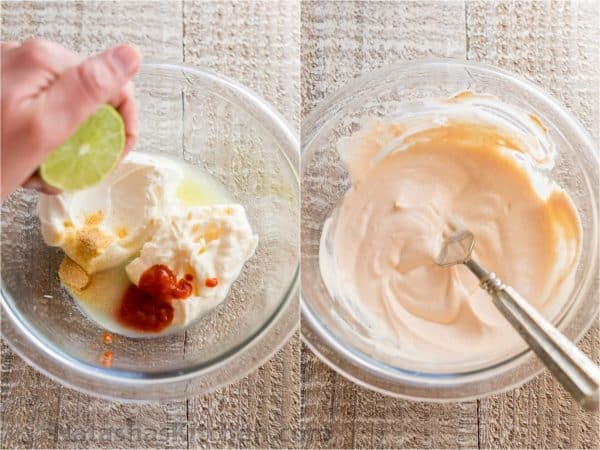 And just wait until you try that Sriracha-lime crema taco sauce!! 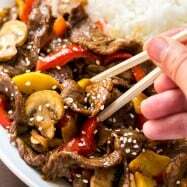 The bulgogi beef (a Korean BBQ beef) in this recipe has incredible flavor as the sauce caramelizes in the skillet, coating each delicious bite! It’s kind of like the beef you try in really good takeout places but can never recreate at home. 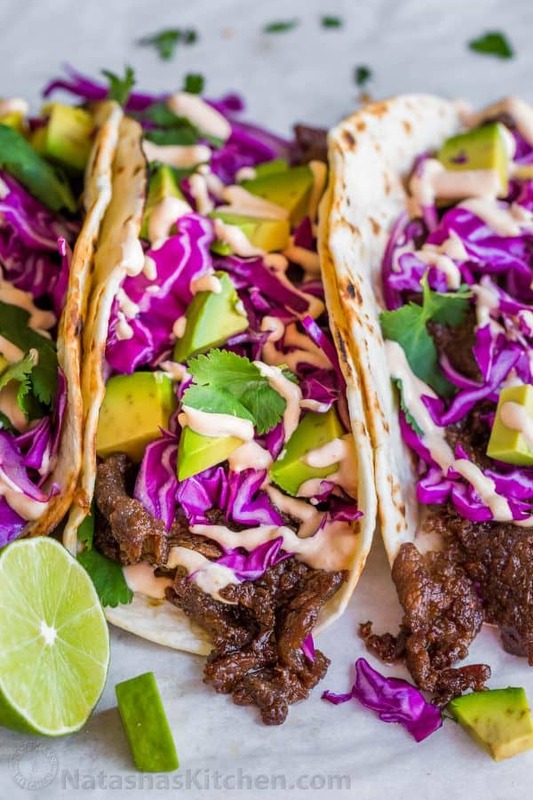 My cousins wife, Alla shared this recipe with me, saying she had discovered these fantastic Korean beef tacos in a spa with a Korean restaurant located inside – a hidden gem! 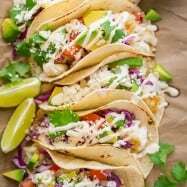 Shoot, I’ve never been to a spa but if there are tacos involved – SIGN ME UP! lol. Anyway, Alla loved them so much, she recreated the recipe at home. 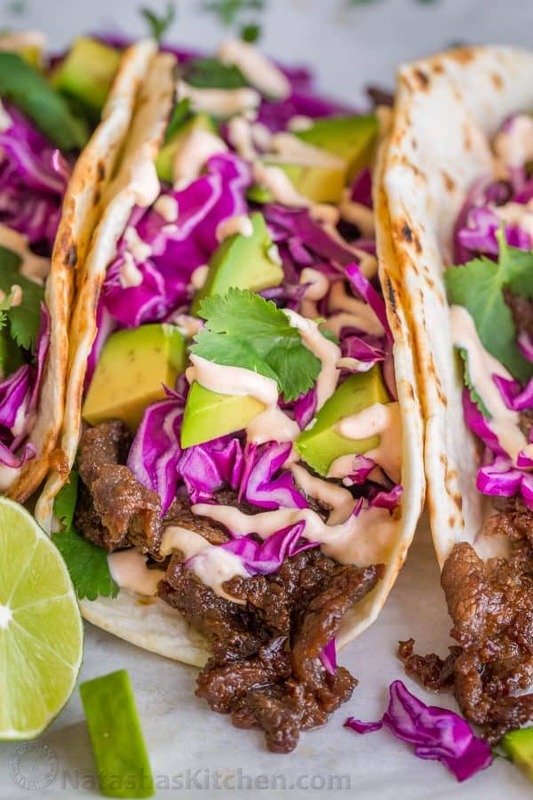 These beef tacos are loaded with flavor! 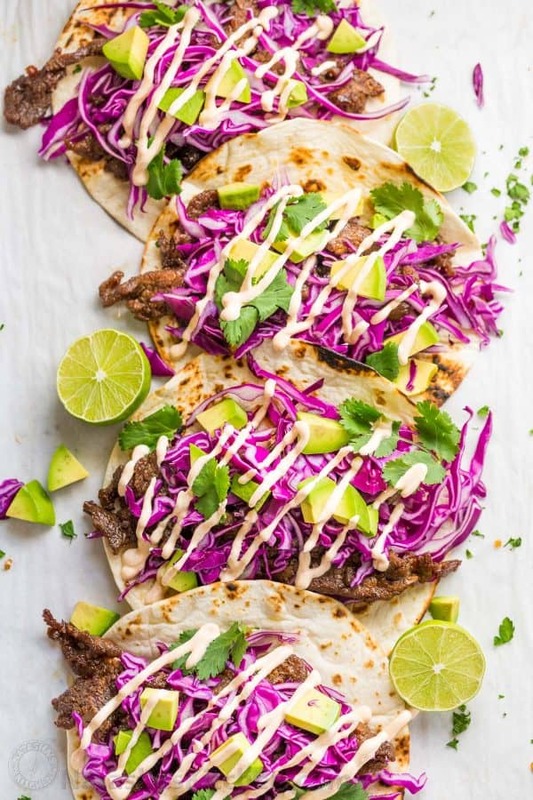 I toasted the tortillas right over my gas stove then loaded them with sweet strips of bulgogi beef, tons of crunchy purple cabbage, fresh cilantro, diced avocado and drizzled generously with a creamy Sriracha-lime crema that is over-the-top incredible. The combination is a flavor explosion and you won’t be able to stop at just one! Did I mention this is the easiest recipe? *Sesame Oil Tip: Don’t skip this or try to replace it with any other oil. It gives the beef marvelous flavor and aroma. We used “Sun Luck” brand (found near the soy sauces in the grocery store). Be sure to buy one that says “toasted sesame oil” in the ingredient list. 1. Thinly slice beef against the grain and place in a medium mixing bowl. 2. 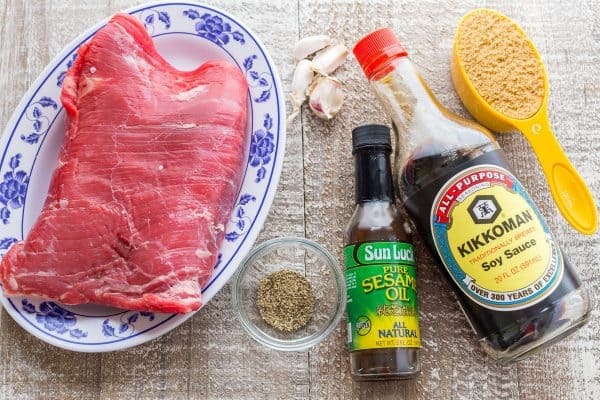 Stir together all marinade ingredients to dissolve sugar, pour over sliced meat and stir to combine. 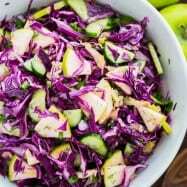 Cover and refrigerate at least 4 hours or overnight for best results. 2. Heat a large, heavy non-stick pan over high heat. It’s hot enough when you place a piece of meat in the center and it has a strong sizzle. 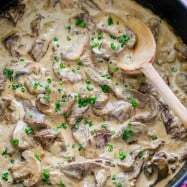 Add meat and let it sauté without stirring for 2-3 minutes or until slightly browned on the bottom then stir and continue cooking additional 3-5 minutes, stirring occasionally or until fully cooked, liquid has evaporated and sauce has thickened. The sugars from the sauce will caramelize onto the beef. 3. Toast tortillas on a hot dry skillet or directly on the grates of your gas stove-top, turning and flipping frequently – they cook really fast so don’t walk away. 4. Stir together all taco sauce ingredients and if desired, transfer to a ziploc bag and snip off the corner for easier drizzling. Refrigerate until ready to use. 5. To assemble tacos, place meat over toasted tortillas and cover with generous amount of purple cabbage. Add several sprigs of cilantro, some diced avocado and drizzle the top generously with the taco sauce. You can add a squeeze of fresh lime juice for extra freshness. Fully loaded Korean Beef Tacos with flavorful Beef Bulgogi (a Korean BBQ beef). 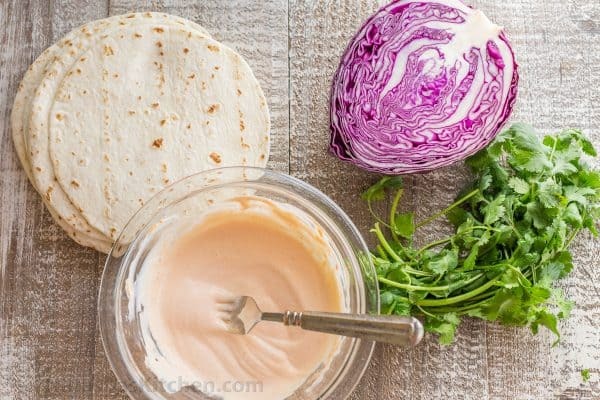 Don't skip the Sriracha-lime crema taco sauce which takes these over the top! 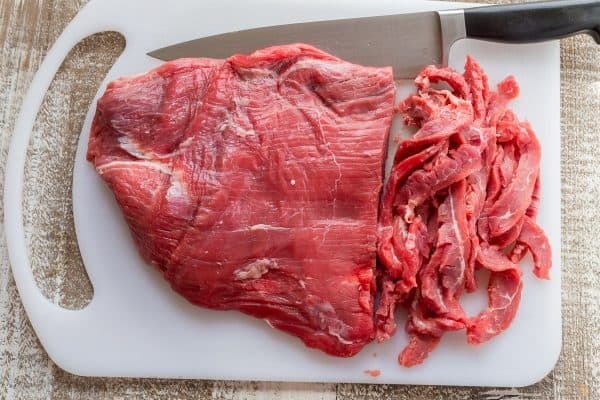 Thinly slice beef against the grain and place in medium bowl. 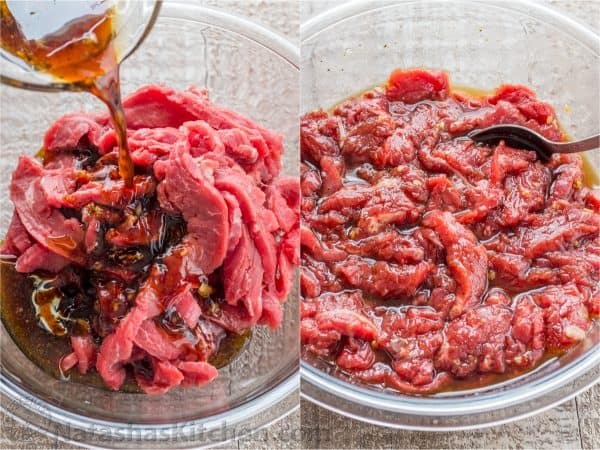 Stir together all marinade ingredients until sugar dissolves, pour over sliced meat and stir to combine. Cover and refrigerate 4 hours or overnight for best results. Tip: Let beef stay at room temp 30 min before cooking. Chilled meat will cool a hot pan and make your meat juice out. Heat a large, heavy non-stick pan on high heat (no need to add extra oil). It's hot enough when a piece of meat placed in the center has a strong sizzle. Add meat and sauté without stirring for 2-3 min or until lightly browned then stir and continue cooking additional 3-5 min, stirring occasionally or until fully cooked, liquid has evaporated and the sauce has caramelized on the beef. Toast tortillas on a hot dry skillet or directly on the grates of your gas stove-top, turning frequently - they cook really fast so don't walk away. Stir together all taco sauce ingredients. For easier drizzling, transfer to a ziploc bag and snip off the corner. 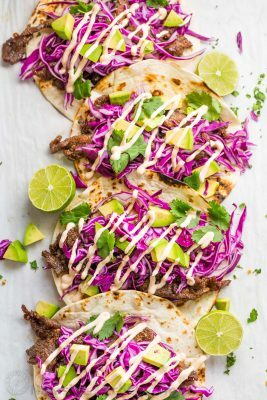 To assemble tacos, place meat over toasted tortillas and cover with generous amount of purple cabbage. Add sprigs of cilantro, diced avocado and drizzle generously with taco sauce. 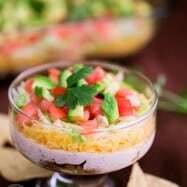 If desired, add a squeeze of fresh lime juice for extra freshness. *Sesame oil should say "toasted sesame oil" in the ingredient list. 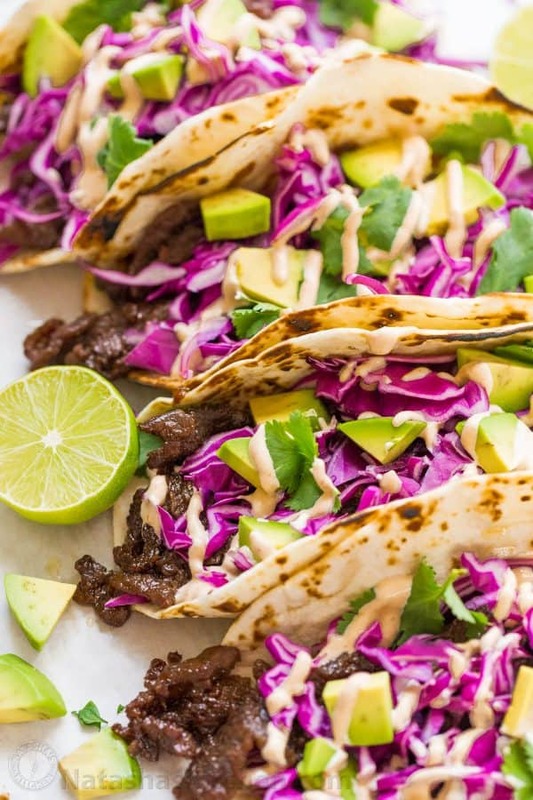 Korean beef tacos are perfect for parties! You can prep most of this recipe ahead of time and everyone can build their own tacos. 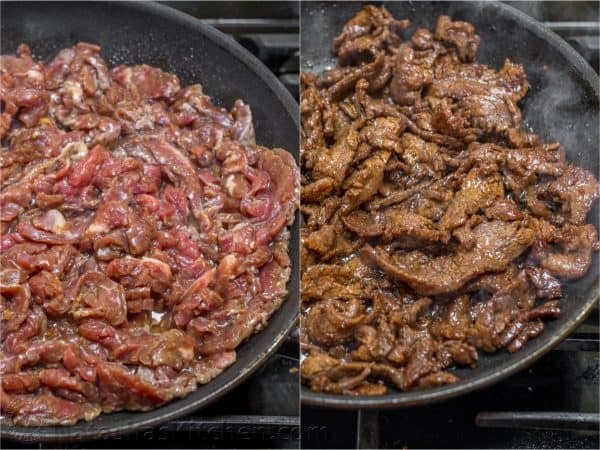 If you’re lucky enough to have leftovers of the beef – it somehow changes flavor profile in the refrigerator after it’s cooked, developing a smoked flavor – almost like a teriyaki beef jerky and tastes amazing cold. My Dad took some leftover bulgogi beef to work and then he called to tell me how it was pretty much the best beef ever. Thanks Dad! 🙂 And thank you Alla for sharing your Korean Beef Tacos recipe with all of us! Can you marinate the whole piece of meat, then grill out doors? We wanted something different for dinner and I found this recipe. I’m glad I did, these tacos are the bomb! The Sriracha Sauce takes it to the next level as well. I literally visit your website nearly EVERY DAY! Much of what I cook throughout the week is planned by going to your website. THANK YOU!